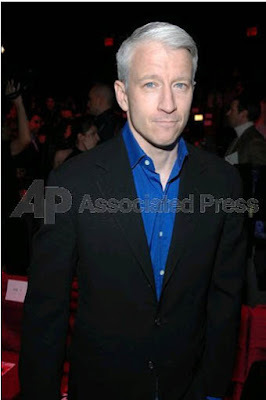 No doubt that Anderson Cooper didn't look too comfortable during the fashion show. Maybe he really isn't into fashion. Probably he is tired, he just returned from Florida. 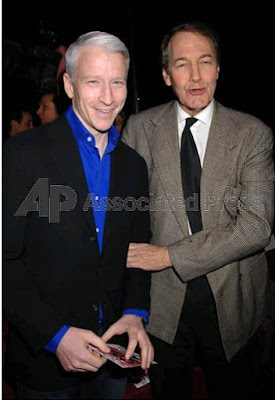 But here are more images of him from the services of Associated Press and Wire Image. 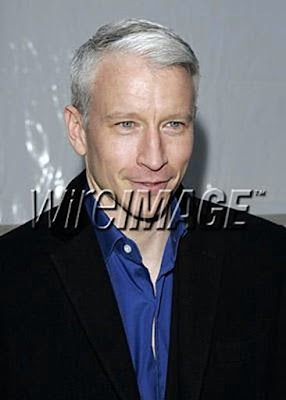 Anderson Cooper at the W Lounge, Mercedes Benz Fashion Week, images Galore! Thanks, but why can't we copy the images? Of course AC didn't have plans to attend nor watch the Superbowl! Has Anderson coined the suit jacket and jeans combo? I think you can, anonymous 1:47. If at first you don't succeed, try try again. If you are going to copy them, please give us credit, because we are very tired of being accused of stealing from other blogs ( when it is actually the other way around ), that's why we installed the right click disable. First time here, thanks for posting the pics and I'm sorry you had to do the disable thing, I know that sometimes we don't play nice ( I did a google search wink wink ). I really like your blog hope to hang around. If you wish copies of the images, just email me and will gladly send you some. wow! I would love to see a larger image from the collage, all those piccies!!!!!!! Thanks for the pictures. I wish I had your ability to find things on the web so quickly and efficiently. Hey Girl! how I'm supposed to find this place if you don't have links to the other andersites?!!!!! I had to use a GPS! I'm a regular at Anderloads and I have to admit that this is my first time here and I'm quite impressed with this blog. I only knew about it by references and all the "behind the scenes drama" and feuds that other bloggers had against you. After reading a lot of your posts ( you can check your site meter to see how long I have been reading today ) I haven't find anything inappropriate, and many of your topics are very interesting. I wish you the best of luck. And keep on going. He looks like an absolute bum. Cute. I love it. I think it's hilarious that you don't let people copy the images when they're not yours to begin with. What's up with that? the source of images is presented here, what prevents you from geting them from the source? FreakSpeakers decided not to let people copy paste images from this blog long ago when we were accused of stealing our images from someone else's blog--despite evidence to the contrary. Yes, the images are not technically copyrighted by FreakSpeakers, but we put our tags on them to keep others from accusing us falsely in the future, and to keep others from using our own artwork and posting it on their blogs without crediting it to us. 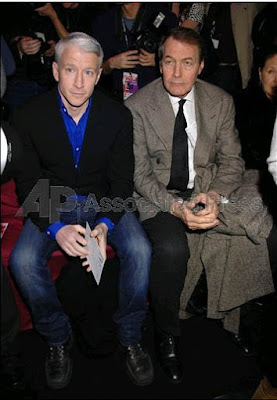 The usually stylish Anderson looking so tacky at a fashion show. This is funny. 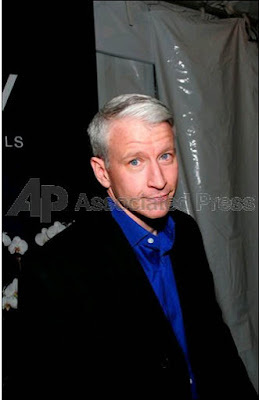 Actually Anderson's fellow Cnn's news anchor Paula Zahn showcased a dress as a model at the fashon show this week. Red Dress. 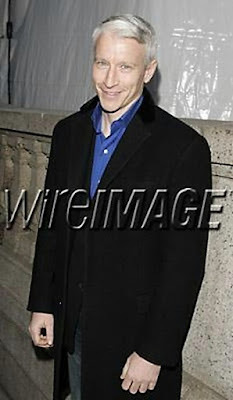 He is so pale without makeup, even the flash bounces off his face. He needs to ask Paris about the Mystic Tan. I can't talk about anyone being pale- I reflect the sunlight when I'm outside! 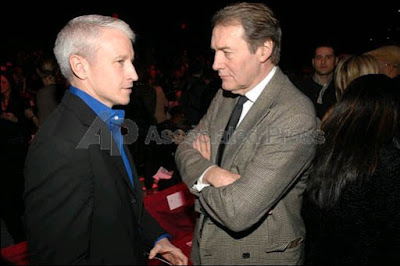 Anyway- I wonder what AC was doing there, he didn't look thrilled at all. Some things will never change. It's always those with the least amount of talent,the biggest mouth and the loudest bark, that go around accusing others of stealing and cheating. I bet a few blogs snoop around here every waking minute of the hour trying to get some inspiration and ideas. Be proud of yourselves FreakSpeakers. No one wants to steal something that isn't worth having in the first place. He works the suit jacket and jeans combo like no one else. He'd be just as gorgeous if he'd shown up there in his jammies. Anderson's boots are filthy. I love this guy! 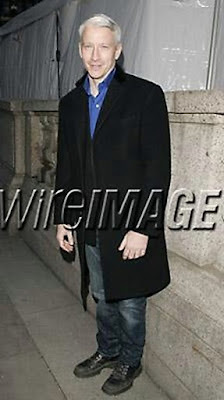 Regarding Anderson's outfit at the fashion show - he's a typical boy off the 360 set, gotta love him for that. Thanks to all the newbies for dropping by, I hope you like the blog and visit us once in a while... to the anons HI! And thanks, again, for the big support! And, if you could e-mail me some of the pics...that would be LOVELY! Andie, they are on their way!